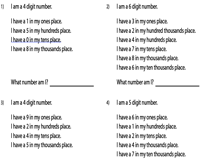 This series of worksheets is a perfect follow to the Units Place Value Worksheets. 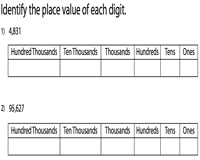 Get students in Grade 3 to expand their knowledge on place values up to hundred thousands. Exercises include determining the value of underlined digits, framing the largest and smallest numbers possible, word problems and a lot more! Click on the free icon to take a peek at our print-ready worksheets! 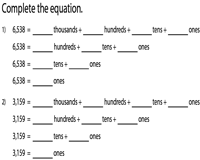 The worksheets feature 4-digit, 5-digit and 6-digit numbers. 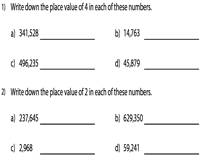 Determine the place value of the numbers in the thousands and record your answers in the boxes provided. Word problem included. Insert equivalent place value to balance out the given equation. Verify your responses with the answer keys provided. Observe each number. 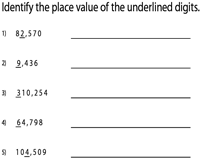 Based on the formats provided, transform the numbers into expanded place value form. Click on the 'Download the set' button to access all worksheets under this section. 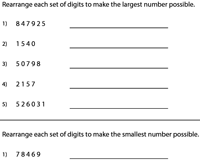 Ascertain the place value of the digits highlighted for each number in this set of worksheets. Represent your answers in either number form or word form. Answer the simple, fact-based word problems featured here. Determine the place value for a specific digit for each series of numbers featured here. Download each print-ready worksheet that comprises six sets of numbers in thousands. 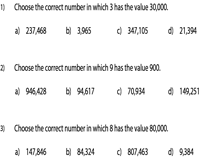 Pick up the correct answer based on the digit and the place value specified for each question. These thousands place value worksheets are sure to bring a student's analytical skills to the fore. Reorder the digits featured here to come up with the largest and smallest thousands possible. 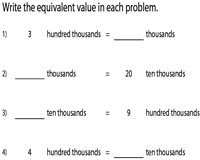 A number of simple word problems are also incorporated in these worksheets. Clues are given in the form of place values. Get students to read and analyze them to unravel the mystery numbers.